There are many hangout places in Jaipur. One must visit these places in Jaipur with friends and family.You will have an awesome experience of nature,food,shopping,art gallery,spa services,health and sports club, Rajasthani culture and heritage, ethnic resorts, sunrise, sunset, photography, wildlife, architecture, landscapes and hills here. One can feel energetic here and get rid of tiredness. It is always an awesome and refreshing experience to visit new places. One can remain closer to nature. It is the biggest park in Jaipur. It is situated in center of the Jaipur. One can enjoy the greenery and good atmosphere here. There is an open gym here.It has 5 km jogging track.There are some sports clubs where one can enjoy.Nearly, you can find Rambhag polo ground and golf club. It is a perfect bird watcher place. One can spend some quality time with their loved ones.Central park is the pride of Jaipur. If you want to enjoy an awesome experience of sunrise and sunset then you must visit this place. Entry fee:- There is no entry fee here. Timings:- The timings to visit this place is 5 AM to 10 PM( all days of the week). It is a beautiful park to enjoy greenery.Musical fountain is must watch here.It has 1400 m jogging track. A big crowd is there in morning and evening.There are swings and slides for children too.There is a rose garden inside the park.There are different walking and jogging tracks.Parking facility is also available here.If you are a fitness freak person and a nature lover then you must visit this place.You can enjoy sunrise and sunset here. Location:- Near EP cinema hall, Malviya Nagar, Jaipur, Rajasthan, 302017. Musical fountain show timings:- 7 pm to 8 pm. It is known for the hottest hangout in Jaipur. It is biggest mall in Jaipur. One can enjoy shopping here. You can hang out here with friends and family.Here you can shop variety of clothes, shoes, makeup, toys, jewellery, mobile, laptop and camera etc. Here is a cinema too. One can enjoy watching movies here. Cafes, restaurants are also there. Foodies can enjoy here. There is also a fitness and health club too. You can enjoy an art gallery too. It has a big parking facility too. Good For:- Shopping lovers, Photographers, Fun lovers, kids, adults, cinema lover, food lovers, fitness freaks, architect lovers. It is a village resort. You can enjoy the Rajasthani culture and food here. There are some musical dance performances in evening time. It is enjoyable for both kids and adults. There is an entry fees for individual. You will enjoy Rajasthani food here. There are a lot of activities for kids and adults too. It has an outside pool too.A tennis court and spa services are also available here. You can also enjoy folk dance here. Entry Fees:- Rs. 800-1000 rs entry fee. Good For:- Photographers, Fun lovers, Food Lovers, kids, adults,architect lovers. Attractions:- Architecture, Musical performance, Rajasthani food, folk dance. Timings:- The timings to visit this place is 5 PM to 11 PM. It is a temple of god Ganesha situated between mountains on top. People go there by staircase to view the temple. There are about 250-300 stairs. It is devoted to lord Ganesha. 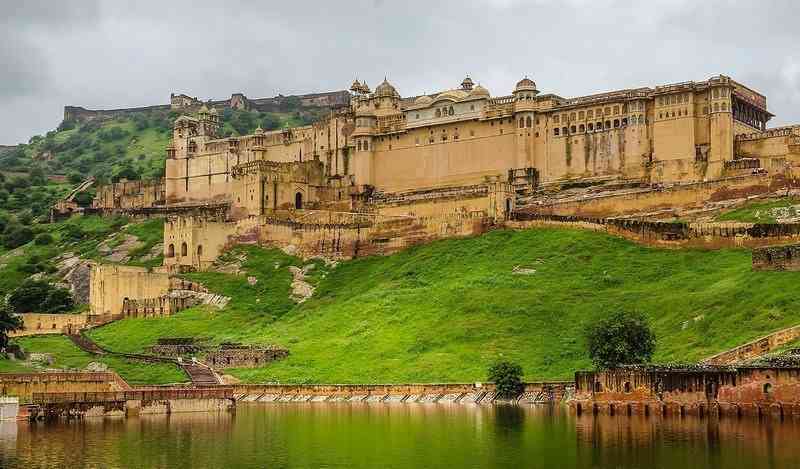 It is located near Nahargarh and Jaigarh Fort. On Ganesh Chaturthi, a fair of five days is organized every year. Photography is strictly prohibited inside the temple. People choose to visit temple in early morning to see sunrise. It’s an awesome experience to see sunrise here. Annakoot and posh month is also celebrated here every year. Entry fees:- There is no entry fee. One can enjoy thrilling exciting wild life safari in Jaipur. You will see some animals like leopard, fox and Chital throughout wild life safari. You can enjoy here bird watching too. It is an adventurous and fun activity to enjoy in Jaipur. Wild life lovers will love it if they visit this hills. This is an awesome place for adventure and wild life lovers. You can enjoy sunrise and sunset here. Entry fees:- Yes, there is some fees 1000-1500 rs. Attractions:- Forest, Nature, Wild Animals, Birds, safari,Sunrise,Sunset. It is one of the famous and beautiful temple in Jaipur. It is devoted to lord Hanuman ji. It takes 1 km to reach the temple. A big crowd of devotees come here for fulfilling their wishes. It has some magical power that the wishes of devotees are always fulfilled. You can enjoy viewing sunrise and sunset here. A large number of tourists come here to enjoy natural beauty of magnificent hills. There is a huge crowd on Tuesday. It is considered that the people never go empty handed from this temple.Their prayers are always heard and wishes are always fulfilled.You can also organize Sawamani and Bhajan keertan here. People whose wishes are fulfilled, they organize sawamani to feed their relatives, friends and their loved ones. It has a big hall to celebrate the occasions. Five hundred devotees can visit this temple at a time.It is a huge temple. Entry Fees:- There is no entry fees. Good For:- Photographers, Nature lovers,devotees architect lovers. Attractions:- Beautiful landscapes, hills, architecture,Sunrise,Sunset. Timings:- The timings to visit this place is 6 AM to 8:30 PM.